Bobgoblin's Bastion | Not yet a grognard… but getting there. SUMMARY: Inventive, wildly imaginative, great set of tools for the ultimate sandbox-style campaign, but suffers from too much focus on other settings and never really comes into its own. SPELLJAMMER was one of the first campaign setting boxed sets published specifically for the Advanced Dungeons & Dragons 2nd edition rules. I didn’t discover it until a few years after that, and at first, I was skeptical. Very, very skeptical. The subtitle said it all: “AD&D Adventures In Space.” That tagline called to mind all the wrong images for me. I immediately pictured elves with light sabers, robot wizards, and lots of ray guns. Everything I’d never want in my fantasy campaigns. Back then, I was a real stickler for genre purity, and sci-fi and fantasy mixes just didn’t float my boat. But I was mistaken. Not about the virtues of genre-blending, but about the content of Spelljammer itself. This was an outer-space game setting, but turns out there was little to no actual science in it. And that is what made it great. I dug further, and found to my delight that there were no light sabers or ray guns; no robots, or computers, or powered armors, or anything like that. 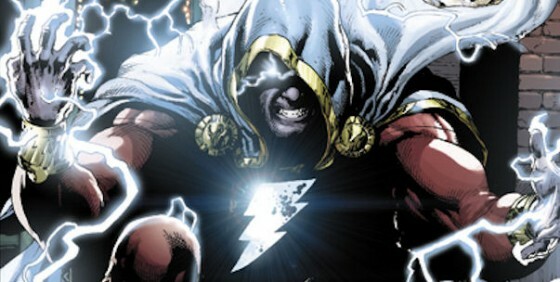 The most advanced technology in this version of space was black powder weapons, and they were not as reliable as magic. Ships in space fought each other with archers, ballistae, catapults, and in some rare circumstances, primitive cannons. There were rules for how things like gravity, oxygen, and other concerns of space travelers worked, and those rules were consistent across the whole universe, but these rules were based on fantasy, not real-world physics. In short, Spelljammer was not a science fiction game using the AD&D rules. It was the AD&D rules and its underlying assumptions extrapolated outward into an entire universe rather than just a single continent on some backwater planet. My initial reaction to this was: “play this right now!” So I did. Within weeks, I had a game up and running, which turned into one of my longest, most successful, and best-remembered campaigns, ever. Perhaps the biggest was the focus on TSR’s other campaign settings at the time: Dragonlance, Greyhawk, and The Forgotten Realms. Each of their crystal spheres was detailed for use by DMs and players, so characters from those settings could easily take spelljamming side-quests in the local version of “outer space.” Or travel from one setting to the other without using magical gates or other powerful spells. All of which is fine, as far as it goes. It made marketing sense, if nothing else, for TSR to draw these connections and provide these tools. The problem with it is that these three settings were made the centerpiece of Spelljammer‘s interstellar (or interspherical?) civilization. Which would be OK, except that most people on said worlds knew nothing about the existence of space travel, and there was very little on any of those three worlds that would attract more than passing interest from the universe-spanning culture sailing among their stars. This approach took a brilliant concept, and reduced it to the equivalent of a plot device to justify crossovers between TSR’s Big Three properties. That ultimately served as a dis-incentive to play Spelljammer on its own terms. Spelljammer deserved its own, stand-alone setting, something that wasn’t constantly defined with reference to other campaign worlds. A setting where, for instance, each of the major races had their own homeworld or home crystal sphere, and their own spare-faring culture. Late in its run, the Spelljammer team started heading in that direction, giving us The Astromundi Cluster boxed set, a fully space-based campaign setting in which everyone was in on “the secret.” But that was too late. 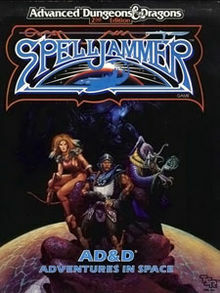 The Spelljammer line was cancelled not long after, and most of its unique elements were incorporated into other products with their numbers filed off. Finally, there are the rules for how most of the spaceships in Spelljammer are powered: helms. These are magical devices which require a spell-caster to sit in them, causing the ship to become an extension of their own body, and tapping the spell power within them for motive force. A cool idea, in theory. The drawback, though, is that helms sucked all the magic out of your spell-caster, even if you only touched them for a brief moment. So, to be effective, a spelljamming party would need to be very heavy on both clerical and wizardly spell-casters: enough members to work in shifts on the helm while still being able to have active spell casters on deck at all times, as well. This could be handled with a large crew of NPCs, but doing that deprived players of the opportunity to role-play their own ship. Most of the time, this aspect of the setting didn’t get in the way, but in retrospect, it’s probably something I would have done differently at the design level. In summary, then, SPELLJAMMER was a hidden gem among TSR’s old-school settings. Even with its weaknesses, it provided my gaming group with two years’ worth of weekly fantasy-space adventure, and ranks among my personal top 5 best campaigns I’ve ever run. If you happen to stumble across it the core boxed set somewhere, it’s well worth your money.